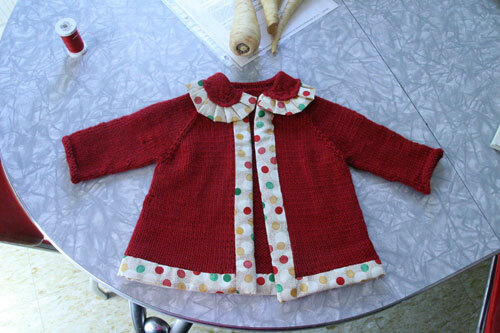 Remember that unfinished red cardigan that I swore I was going to finish for my own baby? Well, I finally did… with mixed results. Sometimes I like to go off the grid with my knitting. This knitting in the wild has created some great items in the past and some sad forlorn items that have been quickly shoved into Goodwill bags or corners of my closet. I know–very shameful. But since I’m more of a process knitter, the final outcome, although important is weighed against the joy of knitting it. I had this idea of making my own super sassy bias tape to edge the little sweater to give it a bit more vavoom. And my love of all things dots drew me to this darling fabric I found at Beverly’s. And then I realized that my rather janky attempt at a peter pan collar was too tiny for the sweater, so I thought I would add a little pleated ruffle to make up the size. Clown-like? As in scary evil clowns that had me crying at the circus when I was four? Seeing that I was near tears over his comment and being a very smart man who has already survived six months with his pregnant wife, he quickly commented, “Oh, now that I see it, it has a more Elizabethan ruffle kind of affect. Nice work, honey! It will look great on the baby!” And immediately brought me chocolate. Smart man. But still, I need some advice on the collar. Perhaps put a little cord or velvet ribbon to cover it up? I don’t know. We’ll see. Thoughts? Oh and we had parsnips in two meals last week. Parsnips are so good this time of year. I think it’s adorable. It looks bigger than newborn size and I think a bigger baby would be able to carry it off just great. I love how you’ve combined the fabric with knitting — very cool! Agreed, totally adorable. Made me think ‘Mini Boden’ immediately. No no, it is not clown like! It is so so cute! J’adore! I think it looks awesome! Nice work. Don’t change a thing! It’s adorable! Looks like it’s unanimous. Very cute and sassy. I think it’s the dots that he thought were clown-like, not the collar itself or the pleating, so since you (and your readers) like the dots, you’re golden! oh my – i just LOVE this sweater. i don’t think the proportions are off in the least… it’s so sweet. and it’ll no doubt look incredible on baby in the early spring. just cant stop with the clowns, can we? Pingback: Good Crafternoon » Happy Holidays!